Since the dot com boom, Silicon Valley has been selling itself to the world as a new breed of global corporation–neutral platforms that sit on top of the world, unconcerned with and totally removed from American geopolitical and national security interests. The public believed it. Even Silicon Valley people believed it. It was the dawn of a new depoliticized corporate internationalism. It was all about a utopian technological revolution that would connect and empower people, regardless of their nationality or language. Indeed, Silicon Valley was supposed to make “the nation” obsolete. Of course, this was always a transparent sham. And perhaps the one positive thing that’s come out of RussiaGate—and the ridiculous mainstream belief that Russia attacked American democracy with Internet memes–is that no one believes this Silicon Valley global utopianism anymore. RussiaGate forced Silicon Valley to publicly admit something that I’ve been saying for years–something that is at the core of the thesis of my book, Surveillance Valley: American Internet companies are not abstract global platforms, but privatized instruments of American geopolitical power. These days, the industry’s corporate utopian internationalism is being gradually replaced with something much closer to the politics that have always been in the background: a politics of patriotism and militarism. Democrats, Republican, diplomats, intelligence officials, journalists, and thinktankers of all types are now in full agreement: the Internet is a dangerous weapon that needs to be restricted. It is too dangerous to not be regulated under a National Security regime. Not that long ago, Senator Dianne Feinstein berated attorneys from Google, Facebook and Twitter for allowing “the Russian” to turn the Internet into an anti-American weapon: “What we’re talking about is a cataclysmic change. What we’re talking about is a major foreign power with the sophistication and ability to involve themselves in a presidential election … You bear this responsibility. You’ve created these platforms…and you have to be the ones to do something about it.” And she followed up with a threat: either Silicon Valley finds a solution voluntarily, or the government will. Openness allows the free exchange of ideas and expression of dissent but also leaves the system, and everyone in it, prey to criminals, terrorists, and, in this case, foreign spies and propagandists: all of them shrouded in anonymity … It may be time to impose some regulations on this system. Censoring the Internet because it’s too free and doesn’t protect us from “the Russians”–this is the acceptable elite opinion in American politics today. And Silicon Valley has done exactly that. Here’s how Facebook, with help from the military Atlantic Council think tank, pegged two antifascist organizations as part of a Russian influence op and took them down. 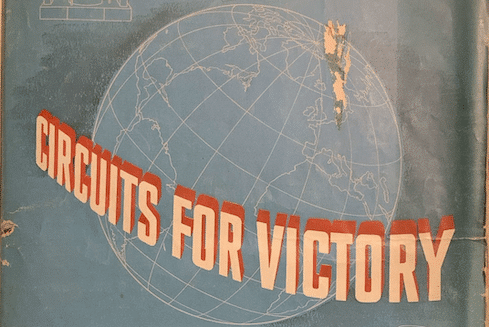 It’s pretty clear that the way things are trending, it won’t be long until Facebook and Google start putting out public relation materials filled more and more with the proud militarism on display in Western Electric’s “Circuits of Victory.” And they should. It would be the honest thing to do. 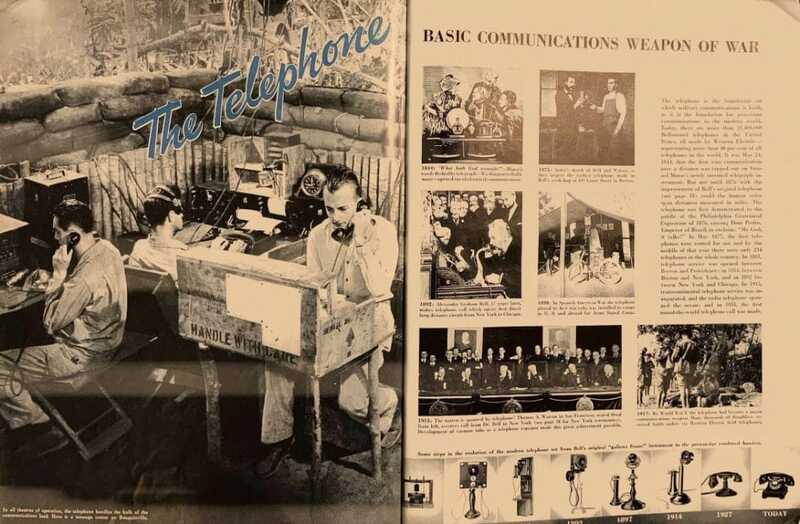 Today, in the full tide of victory, men and women of Western Electric are engaged in their greatest job—producing the communications weapons of war, the radios, radar, the switchboards, telephones and cable that help our fighting men win battles, help save American lives and help maintain the vital home front communication network. … This book tells you something of what we of Western Electric have contributed toward victory in this war. —Western Electric’s President, Clarance G. Still. 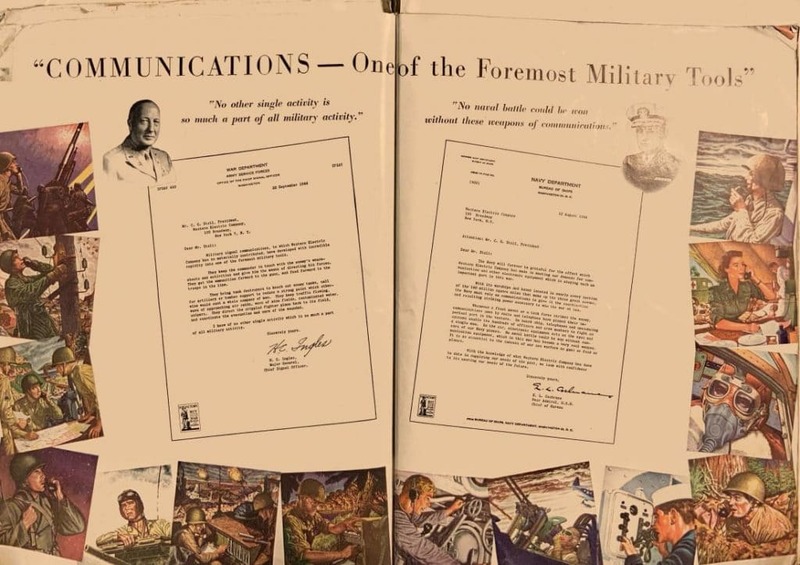 “The Telephone—Basic Communications Weapon of War.” When I interviewed former ARPA Director Stephen J. Lukasik, who oversaw the build-out of the ARPANET in the 1970s, he explained to me the meaning of a military command and control system: “Command means you will do what I say. Control means don’t do what I don’t want you to do.” And you can’t do either of those without a telephone! Now, you can’t do any of that without the Internet. 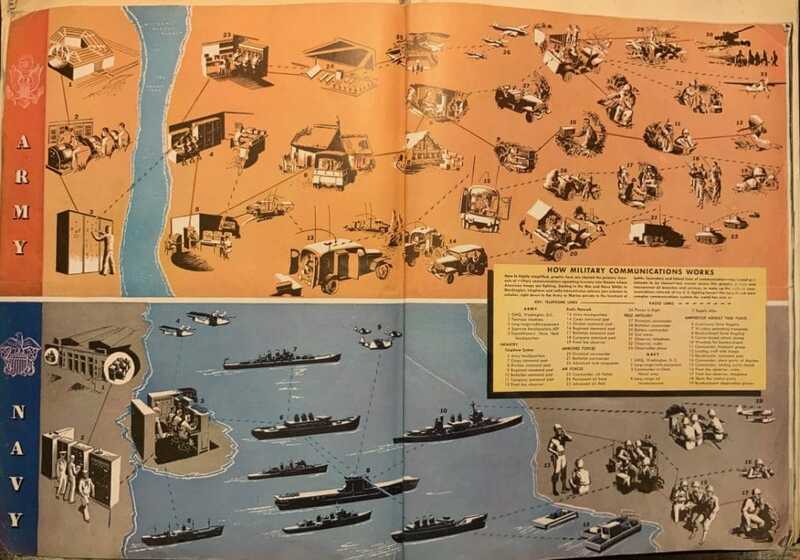 “How Military Communications Works.” This is actually all about radio and telephone communication, but it might as well be a chart of the secure Internet that the Pentagon uses today to link up into a single fighting force. Looking at this chart, you could see why the military began to develop digital networks not long after WWII and why the Internet was ultimately built and deployed. How else you gonna run a complex modern fighting force? 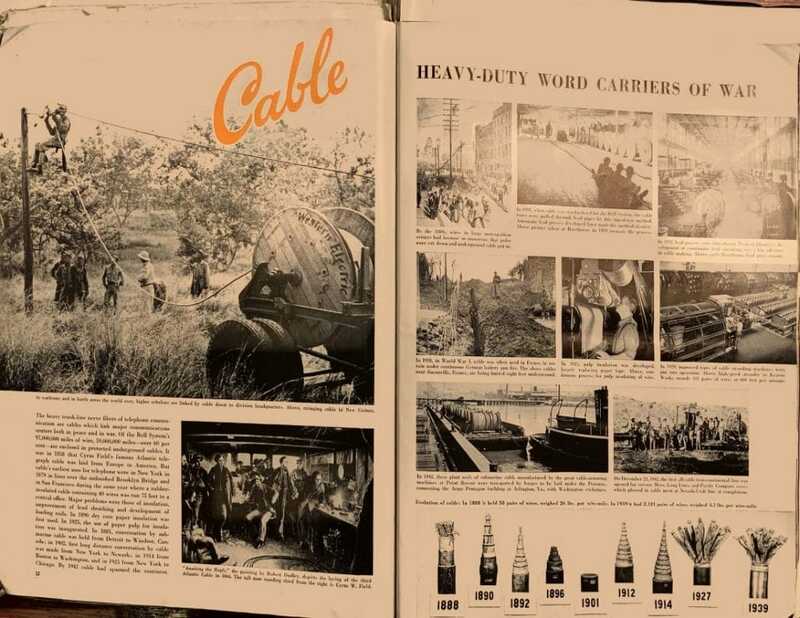 “Cable—Heavy-duty Word Carriers of War.” Today, it’s Internet backbones and satellites. “Switchboards — Nerve Centers for War Messages.” This is what a pre-Internet router looked like. Two shirtless recruits punching cables. 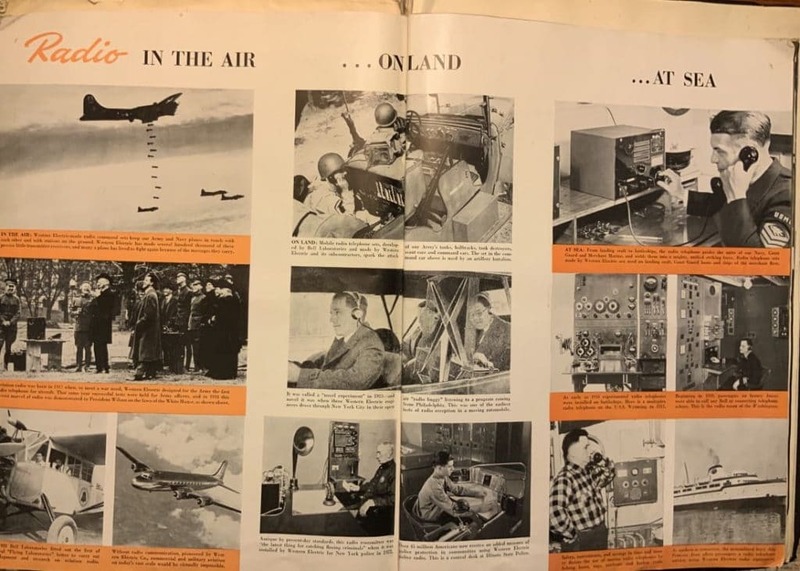 “Radio—In the Air …On Land …At Sea”. A hint at why the U.S. is fighting China on 5G tech deployment. “Communications—One of the Foremost Military Tools.” Replace “COMMUNICATIONS” with “THE INTERNET”–and you basically get Google, Amazon and Facebook. A hint at why the U.S. is fighting China on 5G tech deployment.